Q What is the length of chain that comes with this product? 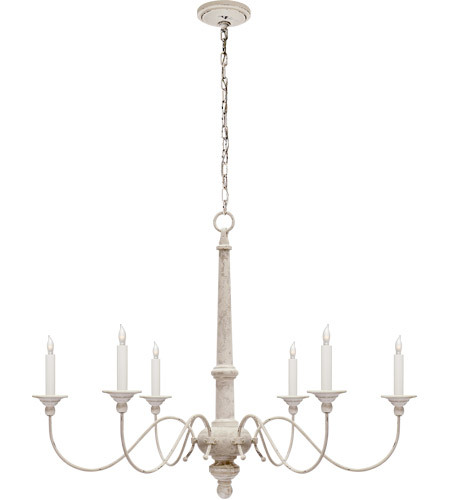 A The Visual Comfort Studio Small Country Chandelier S5211BW comes with 6' of chain. Q does it come in a smaller size? A The Visual Comfort Studio 6 Light Chandelier S5211BW does not come in a smaller size. Q 6' of chain is too long for my 8' ceilings. Am I able to adjust the length of the chain in some way? A The Visual Comfort Studio Country 6 Light Chandelier in Belgian White S5211BW comes with 6' of chain and the chain can be adjusted to any height under 6' as long as one chain link is used. Q Could s5211 bow be used with shades? A The Visual Comfort Studio Country 6 Light Chandelier S5211BW can be used with shades. For more details, please contact one of our lighting experts at 866.344.3875 Option 1. Q What material is this? Wood or metal? A The Visual Comfort Studio Country 6 Light Chandelier S5211BW is made of wood with metal arms. Q Does this come in 24 inch and what is the price? A Unfortunately, the Visual Comfort Studio Country 6 Light Chandelier S5211BW is not available in a 24" version. Q I have a kitchen table 41x94 with 9ft ceiling, is this chandelier to big for the table? A For the Visual Comfort Studio Country 6 Light Chandelier S5211BW: I would have to say yes as we usually recommend no more that 29" for a table that wide at 41", we would be concerned that the people sitting on the sides of the table can hit their head when they get up from the table. Another option, is you can hang it higher than the usual which is what a lot of people do. Q Can this chandelier be used in an outdoor protected screened porch? A Unfortunately no. The Visual Comfort Studio Country 6 Light Chandelier S5211BW is dry rated for indoor use only. Q Is there a pendant light that would go with this chandelier? I have an island that requires 2 lights and I would use this light for over the dining table. A For the Visual Comfort Studio Country 6 Light Chandelier S5211BW: Unfortunately, there are no matching pendants in the Studio Country Collection. However, I was able to find a pendant within the same finish as Belgian White. Visual Comfort Suzanne Kasler Quatrefoil 2 Light Hanging Shade in Belgian White SK5210BW-L.